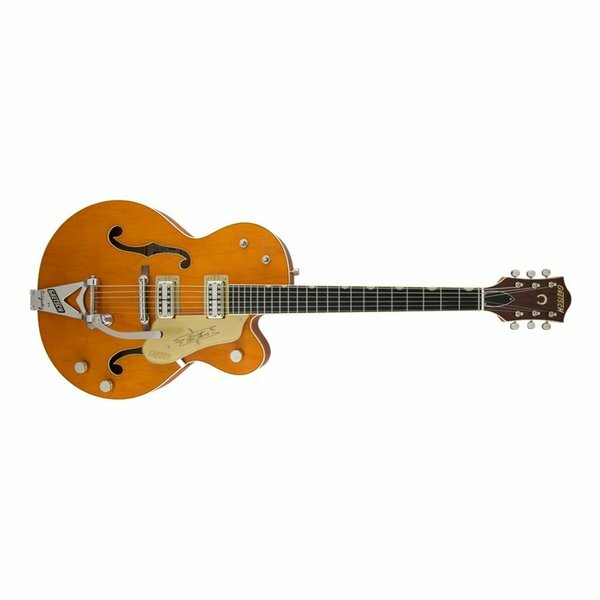 A blast from the classic era of Gretsch's storied past, the G6120T-59 Vintage Select Edition '59 Chet Atkins Hollow Body with Bigsby revisits this historic model. Packed with astounding tone, comfortable feel and elegantly slick style, this instrument is ready to stand by your side onstage or in the studio, bringing out the best in your music and your playing. As refined or raw as you need it to be, this guitar will be an invaluable center-point of your sonic arsenal. A pair of the ever popular TV Jones Classic pickups creates high-quality tone with plenty of dynamics and articulation on tap. 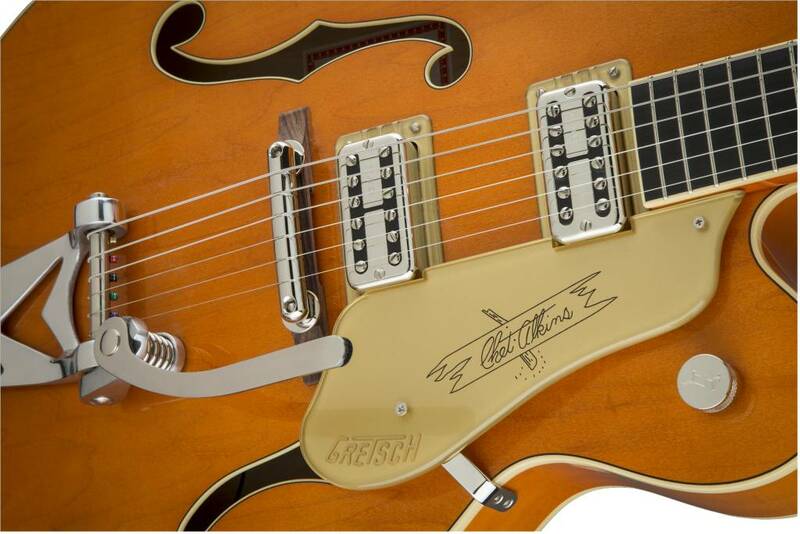 Traditional Gretsch controls, including dedicated volume controls for both the neck and bridge pickups, master volume and the classic three-position tone switch, allow you to blend and shape the pickups' sound, creating countless tonal variations. The new Gretsch "Squeezebox" paper-in-oil capacitors provide an incredibly silky high end. The vintage "V"-shaped maple neck bears a 12"-radius ebony fingerboard with 22 frets for a classic playing experience that works with all musical styles. 1959 trestle bracing connects the top and back of this guitar for authentic, snappy vintage tone. 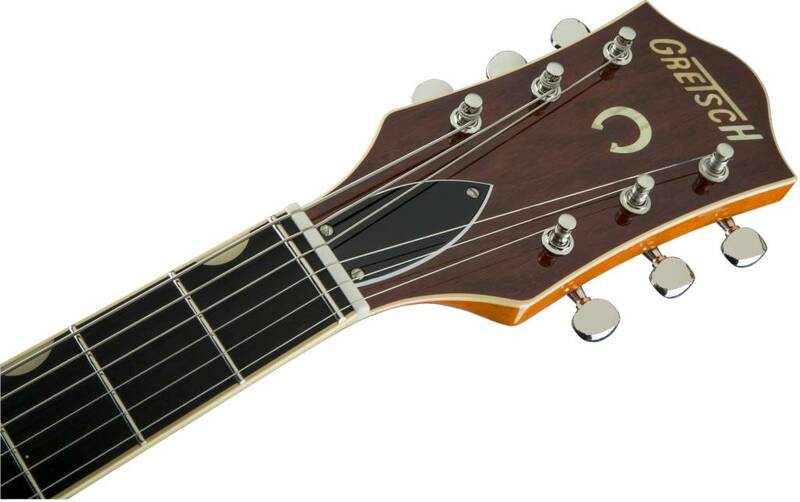 A pinned "rocking" bar bridge reacts in tandem with the Bigsby B6CVT vibrato tailpiece for stable tuning while the vintage-style genuine bone nut lets the strings slide freely without binding in the slots. Designed for pure tone and slick, comfortable playing feel, this guitar features the classic aesthetics true Gretsch fans love-nickel "G Arrow" control knobs, aged white binding with black purfling, durable gloss nitrocellulose lacquer finish, aged pearloid thumbnail inlays, gold vintage thick plexi pickguard with Gretsch logo and nickel Grover Sta-tite tuning machines. 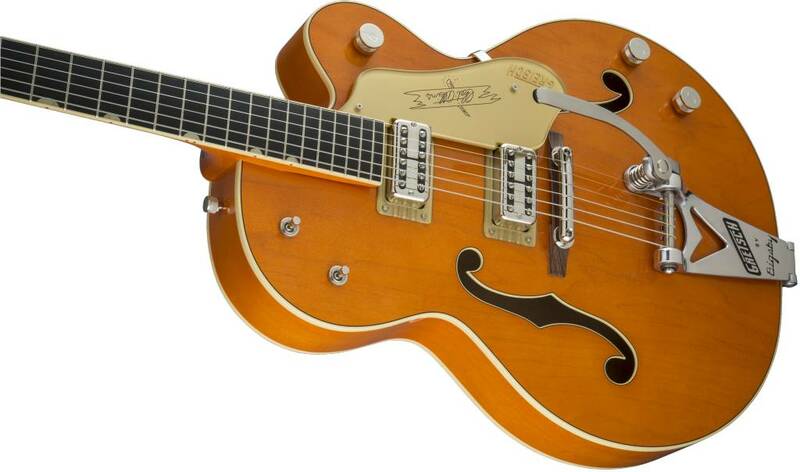 Elegant style and refined sound combine to make the G6120T-59 Vintage Select Edition '59 Chet Atkins Hollow Body with Bigsby a Gretsch aficionado's dream guitar.